Colin’s TrailStar Review. Added a guy to my tent. Colin has a great new review of the Mountain Laurel TrailStar, here. After having read it, I decided to attach a new guy to my tent. p.s. a prize for anyone who recognises this new guy. angus_honey — this is your moment to win a competition in a backpacking blog! Though Slowman should also be in with a chance. I bet he doesn’t get it, though. Doh… blokes! This entry was posted on Tuesday, January 12th, 2010 at 7:32 pm and is filed under Backpacking, LOLZ!. You can follow any responses to this entry through the RSS 2.0 feed. You can leave a response, or trackback from your own site. 16 Responses to Colin’s TrailStar Review. Added a guy to my tent. Have you really got it? I will look out a nice prize for you! Wilson from ‘House’. Too late, I know. I didn’t think anybody would spot it, except perhaps Le Slowman as I know he’s also a House fan. 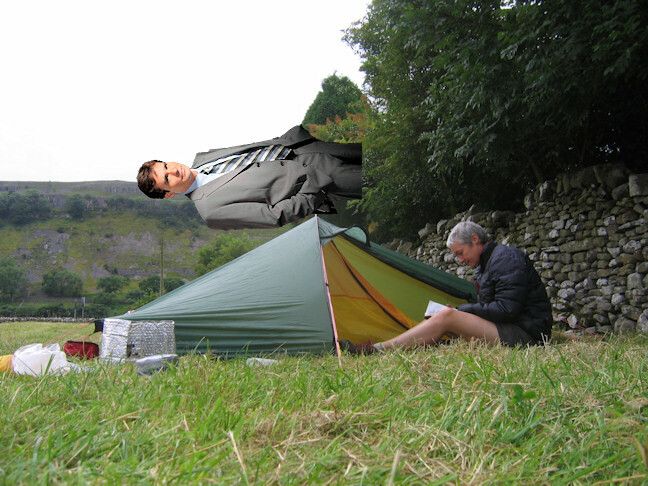 If I was going to add a guy to my tent (presuming I had one, which I don’t because I have a house and bed instead…) I would add the guy inside the tent, sans clothes, and wrapped firmly in some sort of downy sleeping bag, pegged (is ‘peg’ a camping term because I was going to use ‘fastened’ but ‘pegged’ does sound, somewhat, as if I know a little something about the outdoors life…) to the ground. I would then be far too tired to do anything else and leave to find the nearest hostelry with bed and hot running water and redo my nails. I hope you’ve seen the latest epi, with the shorter hair and a chorus from ‘A Chorus Line’, and absolutely no sign, whatsoever, of a tent. ZOMG THERE WAS A NEW EPISODE AND I DIDN’T REALISE?!?!?! So, you wanted Wilsie to chew on your crackling…have a ham roll…pork stuf…no, bnot going there! I am confused… what is this ‘ham’ of which you speak? ‘Pork’?? He’s so literal. It was he who named Puss-Puss, of course.